Art instructors often speak sagely of positive and negative space. One might consider that such a concept is only useful in an additive art form like painting, where the practitioner works from a blank ground. This is a useful educational tool applied to photography. Loosely defined, positive space is, ‘object’; Negative space is the area between ‘objects’. Hence the title: Form (positive space, not space at all!) and Void (negative space). It is easy to imagine an empty studio environment with two figures, and how their relationship can be understood and enhanced by controlling the (negative) space between them, a space that lacks detail, and is just plain tone (whether light or dark). In such an environment it is easy to grasp the idea that the shape of that space might have significance, an identifiable shape. 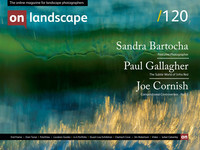 But what of a landscape? Many landscapes lack a single or obvious object/subject, or there might be a chaotic crowd of them, in woodland for example… and what of all the textured, coloured space between them (i.e. the land) is that form, or space? The sky may be an obvious example of space, but what if it is a key component or even the main subject of the picture? How does this relate to the positive/negative space concept? In truth, I have always approached the positive/negative space theory with a dose of scepticism. It appears to oversimplify what is ultimately a matter of tonal, colour, spatial and linear relationships. And yet this simplification process may be valid when trying to get to grips with the building blocks of picture design. Indeed, graphic design is a field where form and void have to be constantly addressed – think of page layout. This is then immediately linked to ideas of ‘breathing space’, flow, balance and proportion. Try isolating any visual concept and invariably it tends to be hitched to all the other aesthetic considerations of picture-making.